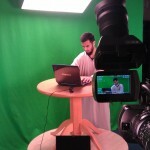 IslamWorldTV ( www.IslamWorldTV.com ) is a unique online Islamic TV. Scheduled to begin in March 2011, IslamWorldTV provides video programs to edict and inspire Muslim youth to hold onto Islam amidst strong temptations to leave practising, or leave the religion altogether, as quite a fair many Muslim youth are now doing. Programs are presented by Shaikh Aslam AbuIsmaeel as well as a list of international speakers and scholars. Update July 2017: This project is on hold at the moment.